A must have for Harry Potter fans. 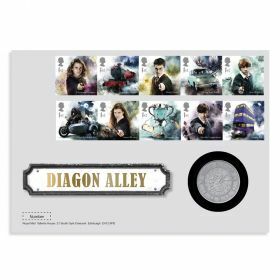 This individually numbered limited edition contains a Silver Proof Medal specially struck by The Royal Mint and featuring the iconic Harry potter logo on one side, plus the crest of Hogwarts School of Witchcraft and Wizardry on the other. Limited edition of just 1000. Contains a Silver Proof Medal specially struck by The Royal Mint featuring the iconic Harry Potter logo on one side and the crest of Hogwarts School of Witchcraft and Wizardry on the other. Contains the Miniature Sheet cancelled with a special postmark outline of Hogwarts. Rich with imagery, the atmospheric pack inside tells the story of Hogwarts School of Witchcraft and Wizardry as well as key locations within the castle such as the Great Hall and the Grand Staircase. Also features the four houses - Hufflepuff, Ravenclaw, Gryffindor and Slytherin. Plus a short biography of Professor Albus Dumbledore. You can also find out what lurks in the Forbidden Forrest and learn about Quidditch and the Quidditch inter-House Cup.